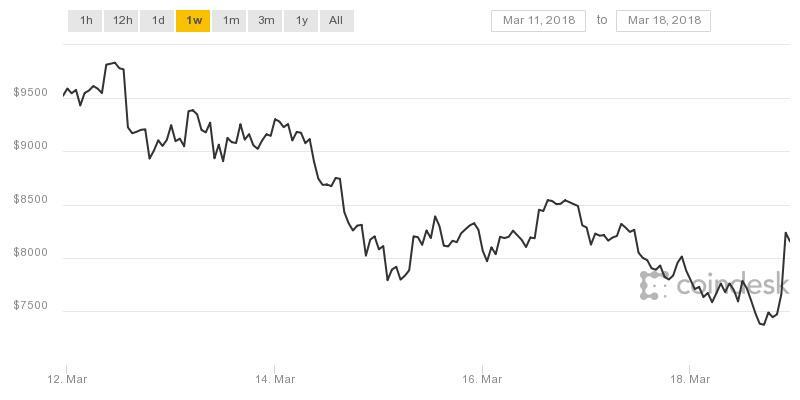 The cryptocurrency hit a low of $7,335.57 earlier Sunday before recovering back above $8,000, according to CoinDesk. Traders were unsure of what was behind the late comeback, but blamed another possible bitcoin advertising ban for the weakness over the weekend. Twitter is reportedly preparing to ban advertising for initial coin offerings, token sales, and cryptocurrency wallets globally, according to Sky News. The new policy could roll out in two weeks, the report said. Google announced an update to its financial services policy last week that will restrict advertising for "cryptocurrencies and related content" as of June. Facebook, the world's second-largest online ad provider, said in January it would ban all ads that promote cryptocurrencies to prevent the spread of what it called "financial products and services frequently associated with misleading or deceptive promotional practices." "Facebook was previous, but now Twitter is also rumored," said Joe DiPasquale, CEO of BitBull Capital. "Much of crypto demand is retail, so this may negatively impact demand." DiPasquale also pointed to the high price of mining affecting bitcoin's drop. Bitcoin miners use software to solve math problems and are given bitcoins in exchange. That now costs around $8,000 per bitcoin, he said. "Now that it's dropped below that, there's less incentive for miners to continue to keep machines on unless they are in a lower-cost energy area or have a way of producing at less than cost," DiPasquale said. Other cryptocurrencies struggled Sunday. Ethereum fell nearly 17 percent from Sunday's open, hitting a low of $460.09, according to data from CoinDesk. Bitcoin cash and litecoin both dropped roughly 10 percent from the open, according to Coindesk. Ripple meanwhile fell 14 percent to 55 cents Sunday.